If you downloaded Pro Speed Check from the Chrome web store so that you could check your Internet speed whenever you desire it, you have lucked out. You can test speeds at test.prospeedcheck.com, powered by meter.net – which means that the service is not even original – and the extension itself is pretty useless. Needless to say, that is why it is classified as a potentially unwanted program. The suspicious extension is compatible with Google Chrome only, and the users of this browser can find it at chrome.google.com/webstore/detail/pro-speed-check/nognlmgiboflbpbfhhpaapgkhegnnekk (Chrome web store). However, it is possible that third-party installers are involved as well. If you downloaded the PUP bundled with something else, you need to be vigilant. It is best if you install a trusted malware scanner to inspect your operating system and browsers reliably. In the end, you will know if you need to delete Pro Speed Check alone, or if you need to remove other threats along with the PUP. 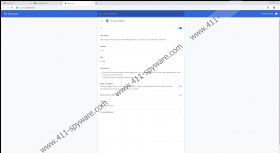 Those who download Pro Speed Check from the Chrome web store are informed via a pop-up that the installer of the extension affects the default search provider of the web browser. If you go through with the installation, feed.prospeedcheck.com will be set as the default search provider. Is this search tool trustworthy? We cannot classify it as a trustworthy search tool because it redirects to a third-party search engine, which is done without permission or warning. As you enter a search keyword into the search bar at the top, your query will be redirected via feed.prospeedcheck.com to search.yahoo.com, which is Yahoo Search. Although you might be familiar with this search engine, and you might trust it, you have to keep in mind that the results you are shown could be modified. What does that mean? In some cases, search results can show advertisements or links to pages unrelated to search queries. Overall, the search tool is not considered to be trustworthy, and that is another good reason to remove Pro Speed Check. The pop-up that shows up prior to the installation of Pro Speed Check also informs that the browsing history is recorded. This is proof that the PUP spies on you. So what if it does not record highly personal information? Its ability to record data about your browser, as well as track which sites you visit, which links you click, or which ads you interact with could be more damaging. Although Pro Speed Check does not show ads per se, it is possible that the collected data could be used to advertise via the search engine. We do not recommend interacting with search results due to this reason. In the worst case scenario, you could be tricked into interacting with a scam or a malicious webpage. If you still think that you should give the PUP another chance, remember that it is useless. If you want to check your Internet speed, all you have to do is visit the right site. You definitely do NOT need to install a questionable application for it. You can remove Pro Speed Check as a regular extension. If you have experience eliminating other unwanted extensions, this process should not raise questions for you at all. Of course, for your convenience, we have created a short guide that presents all of the steps that must be completed. Of course, keep in mind that these instructions were created to help you delete Pro Speed Check. If other threats exist, you will need to approach them in a different manner. You should find removal guides for the threats active on your system via the search bar at the top, but if you cannot, post a comment below – we will help you shortly. You also have the option to install an anti-malware program. It will automatically detect and remove all threats that might be active, and then it will also ensure that your system is protected at all times. This, without a doubt, is the top reason why every system’s owner should implement reliable anti-malware software. Launch the browser, tap Alt+F, and choose More tools. Click Extensions to access the menu with all installed extensions. Click the Remove button next to Pro Speed Check. Click Clear data and then restart the browsers.